Two Stars Will Be One? Astronomy Science ~ Astronomers have captured two stars who are doing the action. MY Camelopardalis star is a binary star system are so close that they will eventually merge and unite forming supermassive star in the future. To get better glimpse of MY Cam system, the researchers used observations from Calar Alto Observatory. This shows that this system is the most massive binary star system seen so far. That's because this system consists of two stars of spectral type O, blue, very, hot, sunny and diameter 38 and 32 times the size of our sun. Even more interesting is the two stars orbiting very close, with orbital periods of less than 1.2 days, which is the shortest orbital period on the type stars like this. Stars, like our sun that moves itself in the galaxy is relatively rare. Instead, they are usually paired with a companion star and creating a system of binary or multiple star systems. In this system, all the stars move their orbits around the center of mass. In particular, the stars are much larger than the sun contains a mass equivalent to a lot of sun in order to present themselves. In the case of MY Cam, things like that plain and easy for stars to minimize its orbit, especially considering how large they are. That's why astronomers believe that the two stars can actually touch and outer layer material has been mixed. This material enveloped them and make Cam MY contact binary star one of the greatest known. The most interesting aspect is the possibility of the two stars will join in the future, creating a mega star. Currently, scientists are not sure about the details of this merger process because it has not been seen before. But this shows that other massive stars may have formed in this way, when the two stars together. 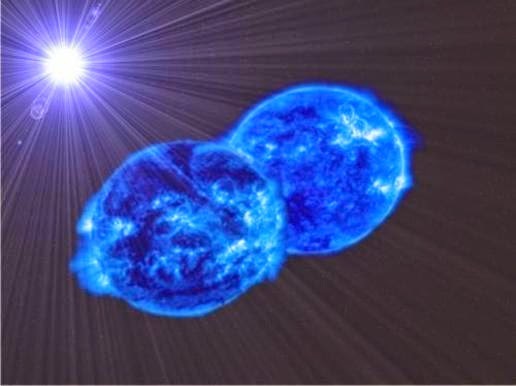 Astronomy Science: Two Stars Will Be One?